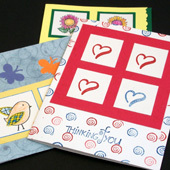 Enhance your correspondence and greeting cards with these crafts. Come back in the coming weeks and months for other projects! Recycled Paper Notepads - Make beautiful and functional notepads from recycled paper! You will use paper from the home and office that is printed on one side, along with scraps of leftover craft paper to make these up-cycled scratch pads. Keep several notepads on hand to give as gifts. Cardstock Animal Bookmarks - Make animal-shaped bookmarks from cardstock. Just print, color, cut and bend to make these cute bookmarks for yourself or to give as gifts. This is a good project for kids to practice coloring and cutting. It is also a quick craft for adults to make as gifts for the grandkids! Envelopes to Make - See how easy it is to make a custom envelope for all of your handmade cards. The envelope can be made from white or colored paper, and can be decorated to match your card. There are printable patterns for three sizes of greeting card envelopes. Greeting Card Case - Follow the instructions in this project to make a storage case for holding greeting cards. Make a special gift by combining this case with your handcrafted greeting cards. The printable patterns in this project make up into three case sizes, including cases sized for the cards featured in the Greeting Card Tutorials. Half-moon Petal Envelope - Have fun making these delightful envelopes with half-moon flaps that fold like petals. Spring and Easter designs are included in the project. Use these envelopes as a gift wrap for small gifts or to store keepsakes. Square Petal Envelope Friday Fun - Learn a surprising technique for making square petal envelopes. These simple envelopes are inspired by Japanese gift wraps and require little or no adornment. They are great for wrapping flat packages or gift cards. Seal Gum Recipe Friday Fun - Learn how to make homemade seal gum for stickers and envelopes. With this adhesive you will be able to make your own stickers from ordinary paper. Make stickers from drawings or stamped images, clipart or pictures cut from wrapping paper—the sky's the limit! This lick and stick adhesive also works great on handmade envelopes. Tissue Paper Painting Friday Fun - Make colorful tissue paper with this super easy technique. Simply pleat a piece of tissue paper and paint the folded edges. Repeat the process once or twice to create an even more exciting design! The painted tissue paper may be used to wrap packages, to cover box lids, line envelopes, and in greeting cards, suncatchers, collages, and much more. Mini-Envelopes for Gift Enclosure Cards - Use the mini-envelope templates to make envelopes that fit gift enclosure cards that are 2¼", 2½" and 2¾" square. See how to make visually striking gift cards and matching envelopes using Handmade Paper with a Contrasting Border. Check out the projects in the Greeting Card Tutorials for card making ideas and techniques. 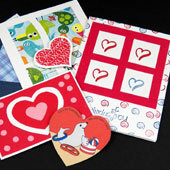 See Aunt Annie's Valentine's Day card projects that will please both children and adults.